Sinigang Soup is a ‘must’ in most Pinoy households’ weekly menu. The whole family enjoys a bowl of warm and refreshing Sinigang dish in hot or cold weather conditions. 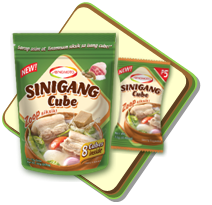 I'd love to try this cube out.Sinigang is one of my favorite dishes. This looks good. I love cooking sinigang and with aji-siningang cubes I am sure my sinigang will taste better. I've been using Knorr Sinigang mix for years because it's the brand my mom has been patronizing since I was a kid. I'll give the Aji Sinigang cube a try.